Welcome Kim & Bae, P.C. 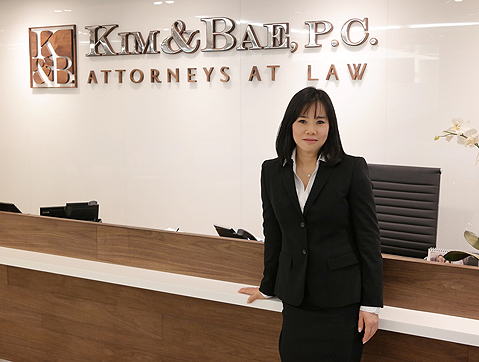 Christine M. Bae is a founding partner of Kim & Bae, PC. Ms. Bae’s areas of expertise include broker-dealer and securities arbitrations, commercial transaction, commercial litigation, and anti-trust cases. Ms. Bae has tried cases and represented many clients in securities arbitrations against UBS Painewebber, Inc., Merrill Lynch, Pierce, Fenner & Smith, Inc., Prudential Securities, Inc., and Citigroup, to name a few. Ms. Bae has litigated these matters in federal and state courts and in NYSE and NASD arbitration forums. Prior to Kim & Bae, Ms. Bae was the founder of Bae & Associates, PC in New York. Ms. Bae is a member of the Bars of the States of New York and New Jersey, and is admitted to practice before the U.S. Supreme Court, the U.S. District Courts for the Southern District of New York, the U.S. District Court for the Eastern District of New York and the U.S. District Court for the District of New Jersey. Ms. Bae has served as the president of the Korean American Lawyers Association of Greater New York from 2003 to 2006, is a member of the Board of Arbitrators for the National Association of Securities Dealers (NASD) and the New York Stock Exchange (NYSE). Ms. Bae is fluent in Korean, conversant in Cantonese and Russian. Ms. Bae has also authored many publications on matters related to securities arbitration law including: Practicing Law Institute, 2001. Securities Arbitration: “How Do I Do It? How Do I Do It Better?” Chapter 22: “Margin Trading” and Practicing Law Institute 2002. Securities Arbitration: Chapter Co-Authored with Carlton R. Asher, Jr. “Chinese Walls ? Procedures and Remedies for Dealing With Conflicts of Interest and Other Abuses by Broker ? Dealers in Connection with Conduct by their Securities Analysts”. Ms. Bae’s cases have been widely covered by the Wall Street Journal, New York Times, New York Newsday, the New York Post, Investment News and Money Magazine, as well as various Korean media, including, the Korea Central Daily News, the Korea Times, KBS, MBC, and local TV and radio stations. Ms. Bae received a B.A. in Psychology from St. John’s University and received a J.D. from Jacob D. Fuchsberg Law Center of Touro Law School. ©2017 Kim & Bae, P.C. All Rights Reserved.